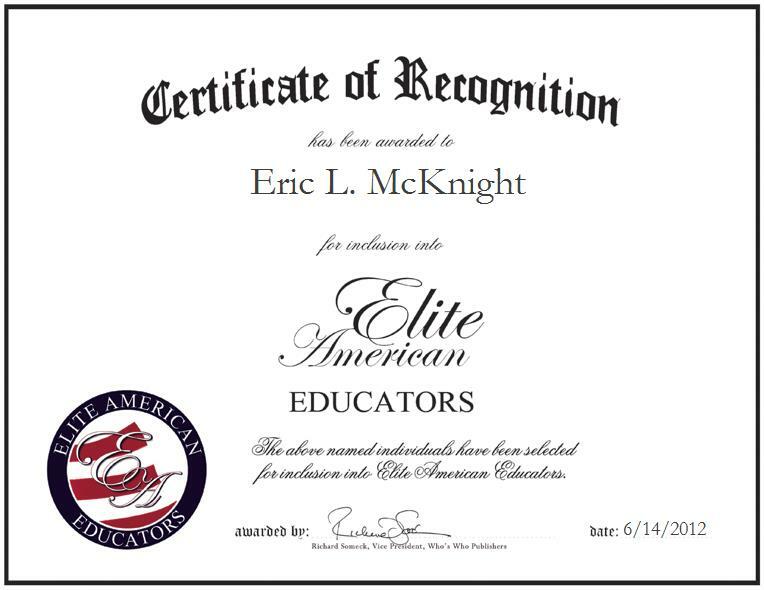 MOORESVILLE, NC, June 14, 2012, Eric L. McKnight, Science Teacher and Department Head at North Rowan High School, has been recognized by Elite American Educators for dedication, achievements, and leadership in secondary education. Specializing in biology and physics education, Mr. McKnight shines as a luminary in his field, bringing forth a wealth of knowledge and experience to his current role. For more than 22 years, Mr. McKnight has been building on an ever-emergent skill set, which currently enables him to ensure that the school’s curriculum is correct. He is also responsible for observing other educators, ordering supplies, and mentoring two teachers. In addition to these responsibilities, Mr. McKnight takes charge of the task of coaching the football and wrestling teams. Mr. McKnight feels strongly about the need to send more students to college. He is lobbying to bring more upper level science classes to the table at North Rowan High School. He also believes in the value of sports in education. He has coached wrestling and baseball for many years, and he has also served as a baseball coach in the past. Mr. McKnight received the 2002-2003 Teacher of the Year Award for his outstanding efforts.